Flux analysis is performed to infer intracellular metabolic activity using measured rates. 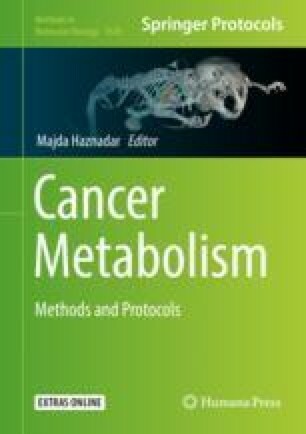 By applying the highly curated human metabolic reconstruction Recon 2 as the reference model, the investigation of cancer cell metabolic fluxes can encompass the full metabolic potential of a human cell. But in its full form, Recon 2 is unsuitable for conventional metabolic flux analysis due to a large number of redundant elements. Here, we describe a procedure to reduce Recon 2 to an appropriate scale for cancer cell flux analysis such that calculated flux intervals are still informative, without compromising the opportunity to explore alternative pathways encoded in Recon 2 that may reveal novel metabolic features. The online version of this chapter ( https://doi.org/10.1007/978-1-4939-9027-6_25) contains supplementary material, which is available to authorized users.